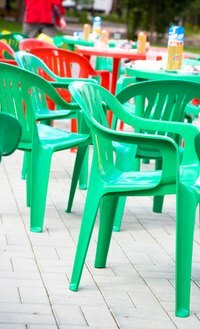 Storing plastic lawn chairs in humid, dim areas encourages mildew to grow on them. Basements, cellars, bathrooms, closets and other poorly ventilated rooms are breeding grounds for mildew. This thin black or white growth flourishes on dirty objects, leaving a musty odor and eventually causing discoloration. It is essential to clean affected lawn chairs promptly to prevent them from becoming damaged. Fortunately, plastic lawn chairs are extremely durable and simple to maintain. Certain disinfectant solutions are effective at cleaning and removing mildew from lawn chairs. Take the lawn chair outdoors, if it is not already. Set the lawn chair on a plastic sheet or tarp. Add 3/4 cup of liquid chlorine bleach and 1 tbsp. of liquid laundry detergent to the warm water. Mix the solution thoroughly with a wooden stir stick. Dampen the corner of a cloth in the solution. Test the solution on a small inconspicuous area of the lawn chair to ensure no discoloration occurs. Dampen a soft-bristle brush in the solution. Scrub the entire lawn chair with the solution, starting at the top of the chair and working down to the chair's legs. Keep the solution on the chair for 15 minutes. Spray the chair thoroughly with water from a garden hose. Wipe down the chair with a clean towel. Store the chair in a brightly lit and well-ventilated area. You can substitute powdered laundry detergent for the liquid laundry detergent. Use only chlorine bleach if the chair is white or light-colored; it may discolor darker colored chairs. Substitute oxygen bleach for the chlorine bleach to clean darker colored lawn chairs.